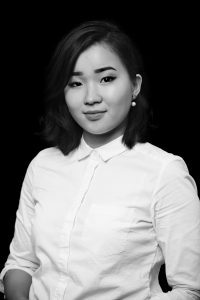 Aike immigrated to Canada from Kyrgyzstan to pursue her dream career in Fashion. She took part in MC College’s Beauty Apprentice program where she assisted with prepping and styling models backstage at the 2015 New Designers Fashion Show. In the same year, Aike got the opportunity to work on a team with her fellow high school students to show off their designs at Kingsway Mall’s Ready to Shine 5 event. There, Aike won a tuition scholarship to MC College to kick start her career in fashion. Throughout her time at MC College, she has done a work placement with MC Alumni, Nicole Campre at WorkHall Studio, and was invited by Kate Spade to do live fashion illustrations at an event in Calgary. Her collection, ‘Army of Me’, is a reflection of her love of combining colour, tradition, culture and elegance. The collection features an eclectic mix of military and minimalistic silhouettes.